Organizations, Governments, and Corporations all need to innovate to improve and maintain leadership positions but this often entails outside the box thinking and highly aversive self disruption. So what is an incumbent leader or well established organization to do? One approach, exemplified by a leading insurance company purchase of an app for 800M last year is to acquire the tech and teams that have achieved traction in the marketplace. Another is to try to innovate from within or with close partners, like one Fortune 100 company last year that spent 50 Million dollars for their new best in class baby product. While these traditional “closed” methods are pretty effective, they are also very expensive. Open Innovation, where you let crowds help, enables innovation faster, better, and at lower cost than ever before possible. Open innovation has been around for centuries with contests that resulted in the development of navigational methods in the 18th century and rockets in the 20th, but not until we all became hyper-connected did it work as well as it does today. Corporations, Organizations, Government Agencies, and simply individuals can direct open innovation programs quickly and easily through online crowdsourcing. Crowds can provide ideas, prototypes, effort, and even funding in ways that can help any organization move forward faster. Open Innovation programs have been found to be over 1,000 times more capital efficient than traditional acquisition-based or in-house development. Yes, there are issues with being too open, but this is accounted for in the design of your Open Innovation outreach, something we can help you with as well. Offer a reward to those who satisfy your mission AND the crowd loves. In addition to creating a great product, innovators must build awareness, drive adoption, engage partners, raise significant funding, and of course, keep building – all at once. Whether you are an established business or a small startup, the challenge is roughly the same. This is why we needed to develop not just a Crowdfunding platform, but a total healthcare innovation environment complete with mentors, partners, community support, patient activists, foundations, engaged physicians, and government leaders. We have found that engaging all the stakeholders in innovation works best. These key services are layered upon and supported by our Award Winning, adaptive Crowdsourcing and Crowdfunding Technology. If you have a vision of how you would like our platform to work better, we will build it fast and well. Check out our Crowdfunding Challenge Demo here or visit our first Challenge in progress by our first corporate partner, Sierra Wireless. These are just two examples of what we can ramp up quickly for our clients. 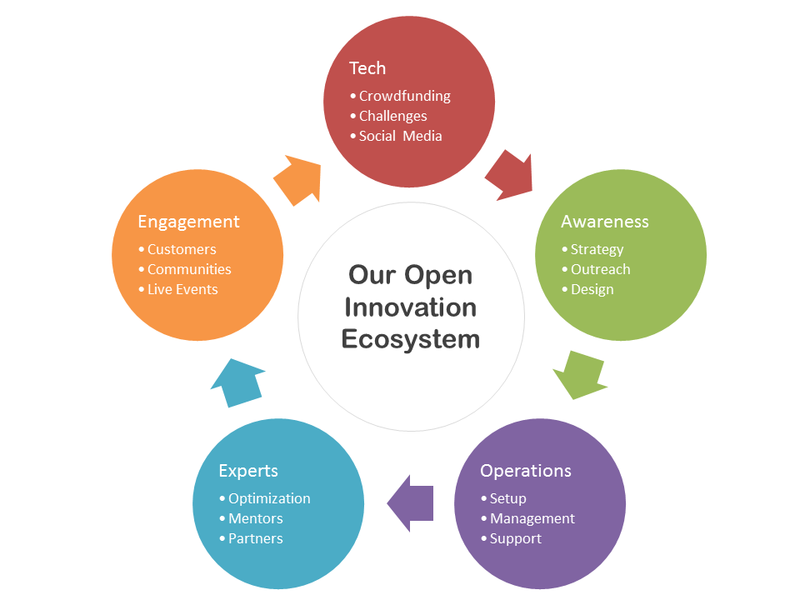 Our Open Innovation Services model has grown organically from what works for driving independent innovation. Partners kept coming to us and our clients, buying them or partnering with them once they achieved crowdfunding success. Our Mentor Network and MedStartr Model also grew naturally and now some of the largest companies in the world helped us design our challenge platform and are using it to find and test partners, investments, and companies worthy of funding. We would love to help your organization too. Please take a moment to tell us about your challenges and let’s see what we can do together!